From Bob Sanchez at Twobobs Decals and Mike Reeves at TwoMikes Resin comes an instant classic - the IPMS/USA 2012 Nationals OPFOR Super Pack. Why list the Nationals? This item was only offered at the Nationals and sold there. A few were sent out afterward, but as of now, this item is gone, never to be released as a package again. Let's open the tube and see what's inside. 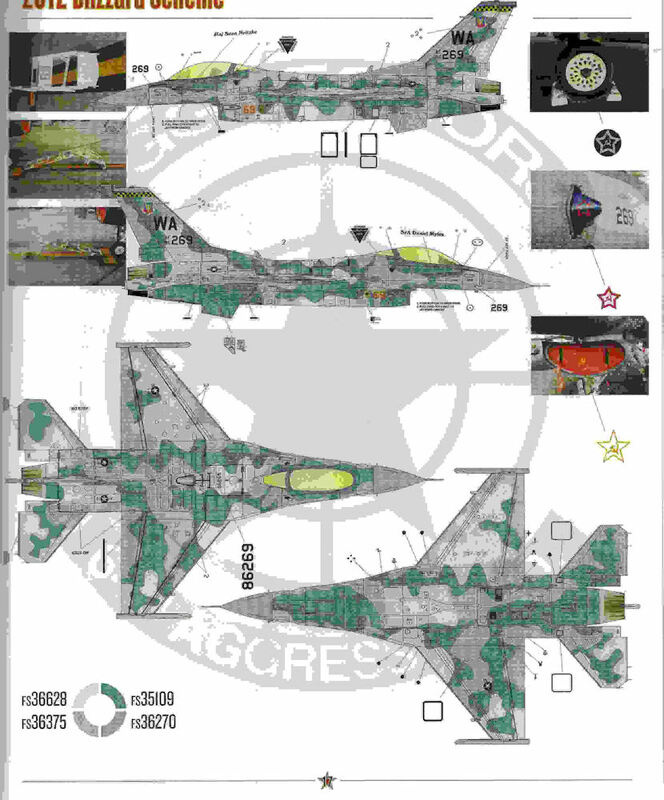 First, there is a comprehensive 24-page color book detailing the OPFOR program of Adversary and Aggressor aircraft programs, TOPGUN, and the history of the entire program. There are also full-color diagrams and painting instructions for the remainder of the contents. The instructions for each are the usual perfect Twobobs. 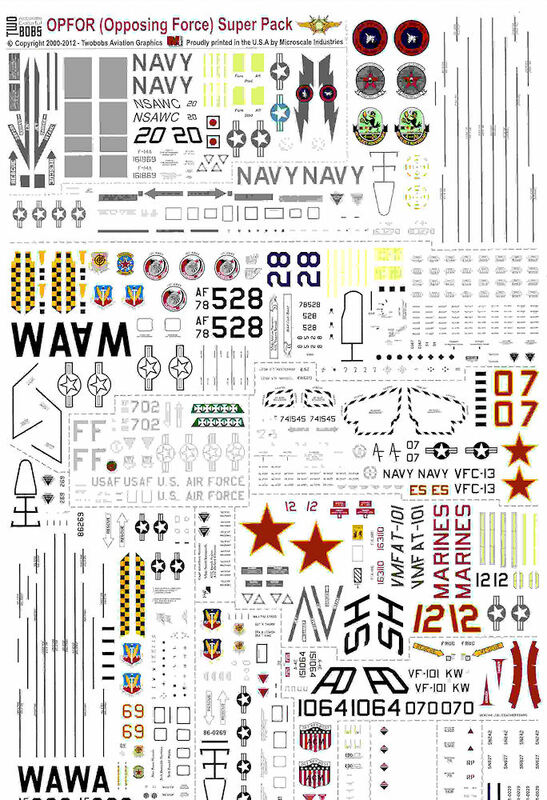 Each has all the necessary paint numbers as FS numbers, as well as all decal locations. Each plane has a picture of the plane and its history, the recommended kit(s), and aftermarket options. Lastly, there are specific modeler's notes on each to provide needed changes for accuracy. Note that my scans are not clear and the colors not quite right, to help the guys protect their property. 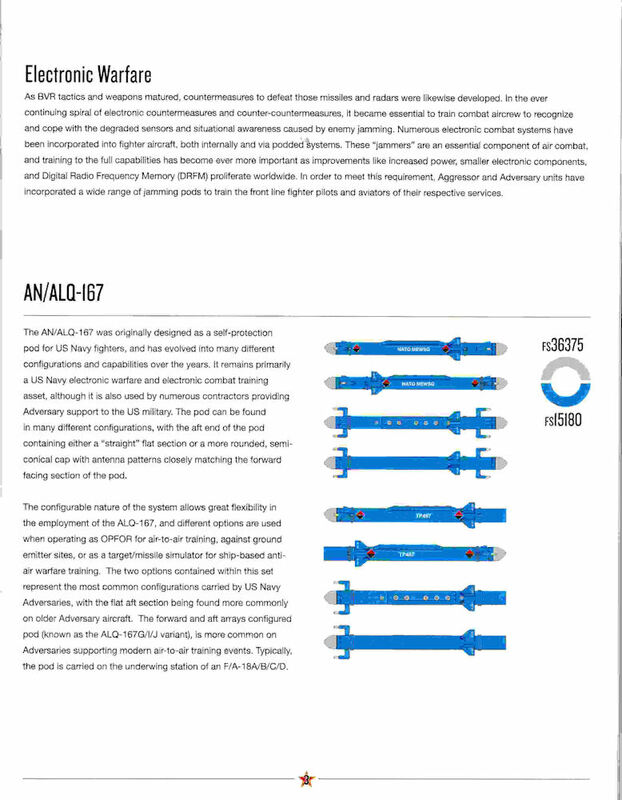 For example, the F-15C lists the available kits as coming from Hasegawa, Academy, Revell, and Tamiya with all the aftermarket listed from TwoMikes, Cutting Edge, Royale Resin, Aires, Eduard, Steel Beech, and Verlinden. 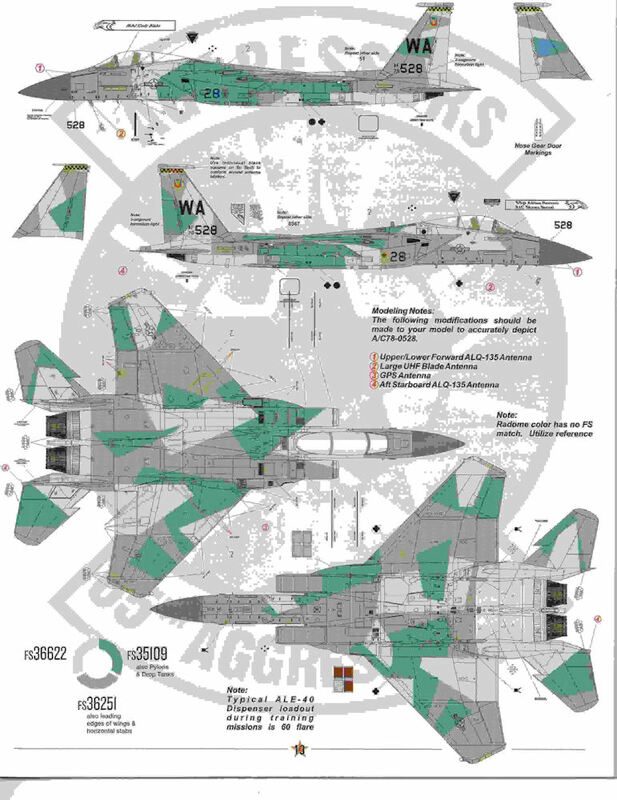 There are modeler's notes about which of the pods can be carried and where, and also a history of the "digital Flanker". I built the pods to try and do them justice, and they are excellent. For fans of the Adversary groups, this is a must-have set. You may have to look on E-bay or one of the web boards, but it is worth it. If you bought a set at the Nationals, great find!. This is easily $90 or more of great items for a mere $50. My thanks to Mike and Bob and TwoMikes and Twobobs for the chance to review this great item. I have already broken out the F-16 to do the blizzard scheme. And even more great news - Twobobs and TwoMikes will do it again at the Denver Nats next year with another surprise. I hate waiting!